MILWAUKEE, Oct. 18, 2018 /PRNewswire/ -- Landscape professionals looking to optimize their productivity, mow faster without sacrificing cut quality and experience a smooth ride have the all-new Ferris® ISX™ 800 from Briggs & Stratton Corporation. The ISX 800 offers the patent-pending ForeFront Suspension System™, the next generation in Ferris independent suspension technology. The new ISX 800 commercial mower will be on display at GIE+EXPO in Louisville, Kentucky, Oct. 17 to 19 in booth No. 5020. "The ForeFront Suspension System proves that we're not done taking care of our operators who ride every day," said Dan Roche, marketing director, commercial products at Briggs & Stratton. "They expect excellent results from their equipment, and we're providing them with advanced technology you would find on an ATV." The ISX 800 has an innovative two-belt iCD™ cutting system which reduces the chance of a belt dislodging or rolling from the pulley, increasing its reliability in a variety of conditions and is covered by a three-year belt limited warranty1. 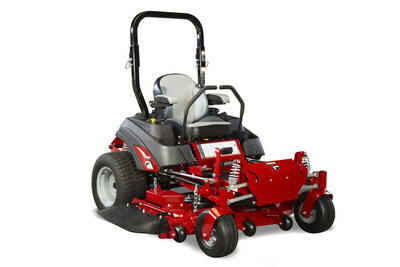 The Ferris ISX 800 is equipped with a Hydro-Gear® ZT-3400® transaxle for added durability with every pass and is powered by the operator's choice of Briggs & Stratton® Commercial Series engines or Kawasaki® engines. Operators can choose from a 52 inch or a 61 inch iCD cutting deck. The ISX 800 is capable of mowing at up to 10 miles per hour and features larger front casters and rear tires than the IS 700Z. A premium mid-back seat provides ultimate operator comfort. Briggs & Stratton Corporation (NYSE: BGG), headquartered in Milwaukee, Wisconsin, is focused on providing power to get work done and make people's lives better. Briggs & Stratton is the world's largest producer of gasoline engines for outdoor power equipment, and is a leading designer, manufacturer and marketer of power generation, pressure washers, lawn and garden, turf care and job site products through its Briggs & Stratton®, Simplicity®, Snapper®, Ferris®, Vanguard®, Allmand®, Billy Goat®, Murray®, Branco® and Victa® brands. Briggs & Stratton products are designed, manufactured, marketed and serviced in over 100 countries on six continents. For additional information, please visit www.basco.com and www.briggsandstratton.com. 1 See operator's manual or www.ferrismowers.com for complete warranty details.